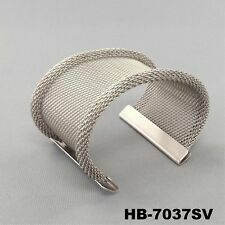 Sergio Gutierrez Liquid Metal SG Wide Silver Mesh Bracelet Cuff Diamond 7.5"
This page was last updated: 24-Apr 18:24. Number of bids and bid amounts may be slightly out of date. See each listing for international shipping options and costs.